Implementing a trade show exhibit at a New Jersey convention or conference is a demanding experience, but Skyline Exhibits offers services to see you through it. Whatever you need, our specialists will work with you to understand your scope and budget and determine a course of action for your booth. We have a team of designers and logistics specialists that can not only develop your marketing collateral but use it as well. Our designers have a multitude of mediums to put your logo or marketing message into the world. If you want a simple banner stand, or something larger like a modular exhibit, to an entirely immersive environment, we will match our displays to your budget and booth size. Trade show exhibits require a lot of planning, so give us a call at 1-800-878-5759 to learn more about our services. Or complete the form on this page and a team member will reach out to you soon. Our trade show exhibits are well-known in the industry as some of the most visible on the show floor. Years of experience with so many different industries gives us the perspective necessary to broadcast your brand to a wide audience. Designs to attract, inform, and experience are what drives up recognition, and we make sure your brand delivers a tangible impact. The expert Skyline staff will support your trade show exhibit during the show as well. We will make sure your booth is installed correctly and efficiently, saving you time and worry before the show even starts. We can assume responsibility for transportation and storage so your focus is on your show and people that visit. 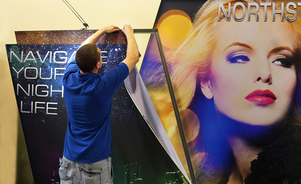 Skyline New Jersey will bring an eye-catching flair to your trade show exhibits. We have a pedigree of delivering high-quality marketing to stand out amongst so many other brands on a convention floor. Fill out the form on this page, and a team member will contact you shortly about your plans for your next exhibition.